Most analysts and commentators are focused on an upcoming shareholder vote at Bank of America, but savvy investors are licking their chops as the bank's turnaround has gained momentum. 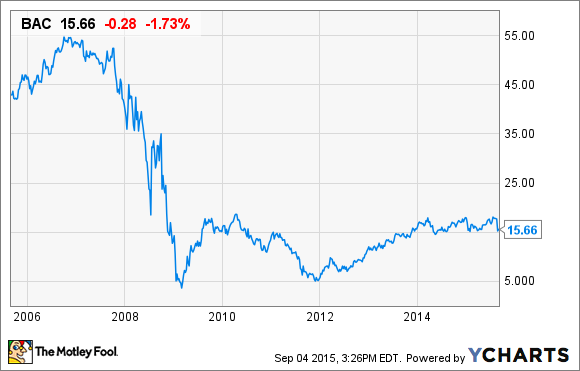 The last few months have been transformative for Bank of America (NYSE:BAC). As a result, while headlines will continue to question the decision to appoint CEO Brian Moynihan as chairman of the board, shareholders in the nation's second biggest bank by assets should ignore this noise and focus instead on the bank's rapidly accelerating turnaround. I don't want to spend too much of your time discussing the upcoming shareholder vote on splitting the CEO/chairman roles at Bank of America, but it merits a conversation because it's the main storyline circulating about the bank right now. Shareholders voted in 2009 to split the role of chairman and CEO. The positions were held at the time by Ken Lewis, a journeyman executive who ascended the ranks at Bank of America's predecessor company, NationsBank. The vote was in response to the bank's losses in 2008 and 2009, most of which were inherited from its 2008 acquisition of Countrywide Financial. Shareholders were right to be mad. Bank of America not only went hat in hand to the federal government for funds to absorb the losses, it also egregiously diluted shareholders to raise capital. Even today, its share price is 70% below its pre-crisis high as a consequence of these moves. Fast forward to the end of 2014, and the board of directors rejoined the roles of chairman and CEO, Brian Moynihan emerging with both. This came across as an affront to shareholders because (1) they hadn't been consulted in the decision and (2) they had previously voted to separate the positions. In response to pressure from Institutional shareholders, Bank of America is giving investors another opportunity to vote on the issue later this month -- on Sept. 22. Importantly, this vote isn't a referendum on Moynihan's performance; it's a reflection rather of the board's poor judgment to move unilaterally. The 55-year-old executive has done a commendable job leading the bank through the worst five years of its existence. He's sold dozens of subsidiaries to simplify the bank and raise capital. He's closed more than 1,300 branches. He's reduced quarterly operating expenses by more than $2 billion. He's slayed the lion's share of legal liabilities faced by the bank. He's even gained the support of Warren Buffett. I think [Moynihan] got handed a terrible situation, with all of the problems -- particularly of Countrywide more than anything else, but some of their own, too. So he was handed a mess. [...] And what he has done is he's working through the problems he inherited, and you can't do them in a day or in a week or a month, particularly ones that involve litigation. He's pared off some of the assets that aren't central to it. He's done exactly what I would do if I was in there. All three major credit rating agencies increased Bank of America's debt rating in the second quarter. More upgrades could reduce its cost of funds by as much as $2 billion a year. A legal decision handed down in July reduced its outstanding legal liabilities by $7.6 billion, and staunched the inflow of new claims. And the Federal Reserve and the Office of the Comptroller of Currencies announced on Thursday that Bank of America would be given additional autonomy in the capital planning process. This is a huge step forward for a firm that's struggled in three of the last five stress tests. My point is this: The intense focus on the upcoming shareholder vote has masked the acceleration of Bank of America's turnaround. Shareholders who see through this noise stand to make a lot of money. But investors who can't get past it will likely be left on the sidelines as the bank's share price soars in the months and years ahead.